SMBs need help and don’t have time to become digital experts. They are busy dealing with the daily activities of running their businesses. A majority of small business owners continue to struggle with which forms of digital media they should use to reach the on-the-go consumer according to a new study from Thrive Analytics, a local search and digital marketing research and customer engagement strategy consulting firm. The study revealed that 77% of SMBs feel they lack the time or knowledge to manage digital media effectively. Many small business owners recognize their shortcomings with 70% stating they wish they could take advantage of digital media to help expand their businesses and reach new customers. The problem is most small business owners feel current marketing providers don’t have their best interest in mind. Owners often feel marketing providers push “flavor of the month” products on them and don’t bother to learn what they actually need. Current providers are falling short on several fronts including poor product performance (60 percent), and poor service levels (55 percent). This contributes to high digital product churn rates (+40 percent depending on the product) and low satisfaction scores given to current providers. Data highlighted in the study, by Thrive Analytics, is from an online survey of more than 1,100 small and medium sized businesses in January 2015. 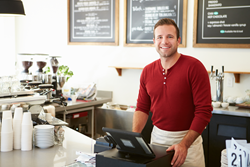 "SMBs need help and don’t have time to become digital experts. They are busy dealing with the daily activities of running their businesses," said Jason Peaslee, managing partner, Thrive Analytics. "Digital providers that listen to their customers and provide frictionless products or services will win in the long run”. Many smaller sized businesses have tried to go the Do-It-Yourself route leveraging their can-do spirit. However, they are falling short in a number of areas when compared to SMBs that use marketing providers. Only, 55% of DIYers have websites and those that do have websites don’t have mobile optimized ones (40% percent). Only 31% have a strategy to attract the mobile consumer and those that manage their own websites update them infrequently (58% percent every six months or more). This further illustrates the fact they need help as well. While this seems like a daunting situation, 51% of small business owners have a positive outlook on their business over the next twelve months. They are willing to increase their budgets (31 Percent) and invest in digital solutions if it makes sense for their business. Top areas they would consider include websites (36 percent), social media (35 percent), mobile (34 percent) and online ads (33 percent). The study also reveals there are distinct differences in marketing needs and approaches between businesses by category, tenure and business size indicating a cookie cutter product approach won’t work for all types of businesses. “This opens the door for marketing providers that can provide tailored and holistic, solutions to meet the needs of each business,” said Jason Peaslee, managing partner, Thrive Analytics. The full study is available to Thrive Analytics research subscribers and is available for purchase. Data highlighted in this release was from Thrive Analytics’ annual Local Pulse survey conducted on small businesses and fielded in January 2015 through Thrive Analytics' Connected Experience Panel™. A total of 1,105 small businesses responded to the survey.